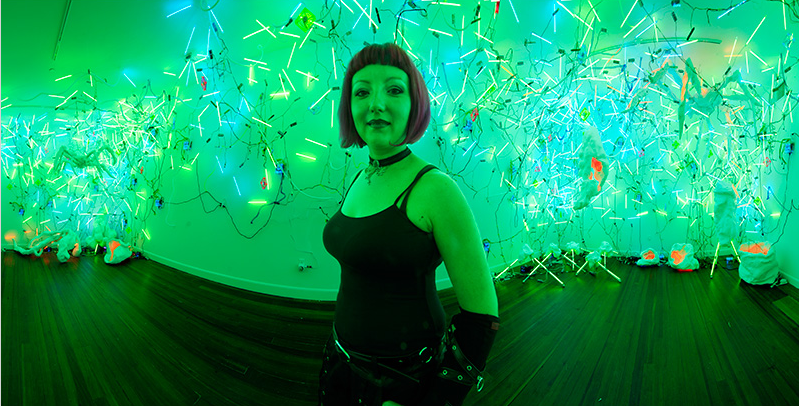 Adela Andea (’09) is an artist known for creating uniquely illuminated and kinetic sculptures. Born in Romania, she received her Master of Fine Arts at the University of North Texas and lives and teaches in the Houston area. To see more of her work, visit adelaandea.com. LUNAR COUGAR: When did you move to the US from Romania? How has that experience influenced your life and your work? ADELA ANDEA: I moved to US in 1999 to Southern California. It was so beautiful and so different from Romania. I have been to the Black Sea the most three times in my lifetime, but my roots are from Transylvania — beautiful lands, but no beach. For the first time, while living around LA area and later Orange County, I was able to go to the beach every weekend. It was a spectacular view, gorgeous ocean shores, cliffs and breaking waves, a postcard fantasy coming true, but like in any fantasy, reality and routine eventually set in. I think the major change in my life after moving to US was realizing that I have so many opportunities and options to do what I want to do. It was a very exhilarating experience. I absorbed all the information I could and tried very hard to understand as fast as possible what my options in this country are and how to improve my life. I was never really interested in preserving my culture or background, I just wanted to learn about the rest of the world as much as I could. The information was very sparse while growing up in Romania. There are so many layers to the definition of an artist. It is an all-encompassing term. In very simple terms, everybody is an artist and we all have an inner desire towards artistic creation. However, I think the profession of being an artist is a very different field. It goes beyond the pleasure of a hobby. I do not condemn any part-time artists or “Sunday painters,” however the level of commitment dictates in the end what makes art a profession. Looking back at my time in school, getting my degree in painting at UH was the definite transition from making art as a hobby to becoming a professional artist. I was very inquisitive in all aspects, from what the contemporary art was to how to make art, and how to think about it as a career. What is the inspiration for your most recent exhibition at the Galveston Art Center, “Lux Aeterna”? What do you hope patrons will take away from the exhibit? My area of focus in the art field is light installations. I use the medium of light to create complex intricate installations and environments. Installation art is different from an artwork on the wall or a sculpture on the pedestal — it usually engulfs the viewer in the artwork because of the gigantic scale and sensory stimulation with the effect of light. I hope the audience perceives the space of the gallery in a new way through my artwork. Installations are meant to push the field of fine arts close to the field of architecture. It is not the gallery that defines the way the artwork should be displayed, but the artwork that modifies the perception of the architecture of that particular space, without physically changing the architecture of the space. This aspect of my work always requires me to take a closer look in advance at the space of the gallery. For the show at GAC, I analyzed several possibilities in advance. The old building with the wood panel ceiling painted white was more appealing than the designated dry wall space. I went above that line and I filled both galleries with two different type of installations starting on the ceiling and waterfalling down towards the floor. The windows of the space are also a part of the installation as it allows the light installation to be viewed from the street. It adds an indoor/outdoor aspect to the work. What is a typical work day like for you, and what is your artistic process? Regarding the artistic process in the studio, it is always easy to create an artwork when I know that I am implementing a great idea and I have a clear plan of what that idea is. The difficult part is to arrive at that idea. That process may seem to be the least efficient time use, but it is the most important and the most exhausting part of creating my art. I can spend months researching and analyzing all kind of materials and ideas. I am also an adjunct professor at several colleges around the Houston area. Even after a long day of teaching, I will still be in the studio for few hours. Sometimes being tired also helps with the creative process. However, the time spent in the studio and the speed I am working also depends on the deadlines approaching. It is great to have deadlines; it speeds up the process, especially when completing a half-baked project or growing a good idea into a large installation. When I have more time and no immediate deadlines, I allow myself to experiment with new materials and techniques, knowing that I can afford to fail time wise. I try to keep very busy, it just feels right for my personality in order to create good art. Can you remember an “epiphany” you had while studying at UH, or the most important thing you learned? I am not sure whether it was a rough critique while working on my major concentration, or if it was me getting tired of I had been creating — I just changed everything I was doing overnight. I am sure it was a longer process, but that moment seemed liked it occurred out of nowhere. I had wanted to be a painter, which was the reason I enrolled in the painting program, but I stopped painting on canvases and started to paint on objects. I think I was afraid to call them sculptures. That transformation moment or “a-ha” moment occurred when I realized that I was restricting myself to the medium of painting and I was not very happy how paint was working on my objects. I looked at the source of how we perceive color: through light. So I switched to the medium of light to be able to give those objects the identity I was looking for. Through more research on the subject and a lot of contemporary influences I decided that my medium is the light itself and the technology of light. The latest technologies on the market inspired me to create the artworks I wanted. My transformation as an artist while at UH has happened also with the influence of my professors, which are also great artists with amazing careers in the art field. Professors like Aaron Parazette, Rachel Hecker, Al Souza, Diane Falkenhagen and many others have pushed my boundaries to become a great artist. What did you like best about the city itself while you were living here? I immediately noticed the vibrant and strong contemporary art scene. I met a lot of inspiring people in this field. Houston has a great number of high quality alternative art spaces and galleries and museums that support very cutting edge artistic endeavors, and I think having this type of supportive system attracts a lot of great artists. The competition is great because it always makes you grow faster. The Houston Art scene extends to the great number of high class galleries. It is here that I got my representation with Anya Tish Gallery and I got this great opportunity to work with her over the past six years. She is a leading gallery in contemporary art trends and a very active contributor to the art scene. Since I have started to work with her, I have had three solo shows. What advice do you have for current or prospective UH students and artists? Follow your intuition, beliefs, vision — whatever you want to call it. Artists are mostly visionaries, but also practical smart people. I think a balance between these contradictory terms is good. It is very hard to teach or learn art. It is easy to absorb or learn art history names, models, movements, however, it is hard to place yourself and be able to dedicate your best energy towards a future unknown unestablished unwritten art history chapter.